Tai is a client at the Nevada Partnership for Homeless Youth (NPHY) as well as a member of the Southern Nevada Youth Action Board, Young Adults in Charge (YAC). She went to NPHY in April of 2018 nearly a month after she and her family were evicted from their home. 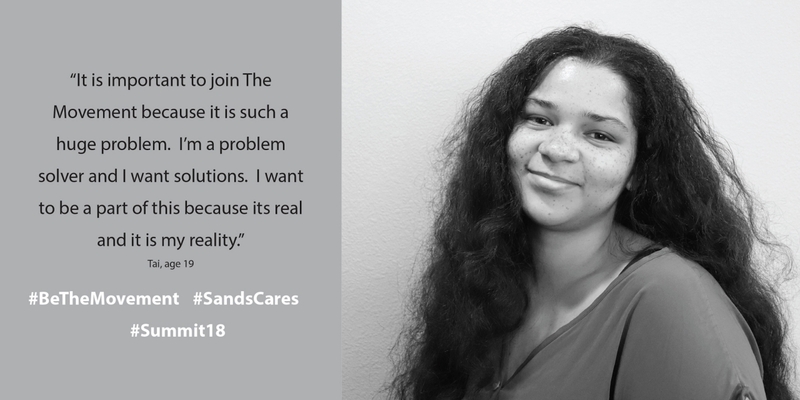 In late June of the same year, she was introduced to YAC and quickly became a leader in the process of building the Southern Nevada Plan to End Youth Homelessness. Tai is a lover of music and acting and is striving for a career in both. She currently devotes her time to babysitting her brother and advocating for homeless youth. What is your role in the development of The Plan? We were presented the strategy and goals of The Plan, then we gave our own personal input on the many components. We were able to give a voice to disabled youth, the LGBTQ community and many other youth perspectives. Why is it important for you to join The Movement? It is important to join The Movement because it is such a huge problem. I’m a problem solver and I want solutions. I want to be a part of this because its real and it is my reality. What do you think is the most important element needed to end youth homelessness? Resources, accessibility and public awareness are the elements needed to end youth homelessness. Solutions cannot exist without the proper resources in place. In regards to public awareness, there a lot of people who don’t know the truth about our unique situations and we want a place to go to get help and the resources that we need. We need to make resources more accessible to youth. There are so many different factors that attribute to how a youth becomes homeless. Adults don’t know what we need. We need to advocate for ourselves. What is your hope for youth homelessness? I want it to end. I hope that if youth are homeless, it doesn’t last for as long as it has. Being homeless as a youth takes a toll on you. It spirals out of control more and more as you’re in it. The youth aren’t the problem… homelessness is the problem.